Compiled by: Zacharie Minougou. Edited by: Andrea Reikat. Series edited by: Beatrix Heintze. Even to experts of the Volta region or Burkina Faso in general, the Yana region will be hardly known. It is situated in the midst of the “traditional” states of the Moose and Gourmantché in Burkina Faso and the Mamprussi and Dagomba in Ghana. In precolonial times the Yana region was not organized as a state, and until today it is not integrated into one of the neighbouring states. Nevertheless, its inhabitants – Zaousé in the northern part, Yana and Moose in the southern – claim to have been resident even before the founders of the Moose and Gourmantché states in this region: They are said to have moved to found their own kingdoms. Zacharie Minougou, a farmer from near the town of Tenkodo, has worked since 1992 as assistant and translator for members of the Sonderforschungsbereich 268 Kulturentwicklung und Sprachgeschichte im Naturraum westafrikanische Savanne. In winter of 1996/97 and in summer of 1998 he carried out inquiries in the Yana-Zaousé region on his own initiative, collected a bulk of material and transcribed it. The most important statements of the interviews in the Yana region found their way into the present work. The information contained was arranged and commented by the anthropologist Andrea Reikat. The aim was to maintain the integrality of the interviews to document the argumentation style of the interlocutors. For the first time there are available sources of this region which refers to itself as the “cradle” of the neighbouring larger areas. 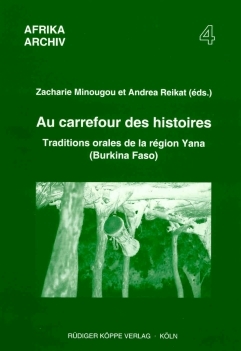 As the language of the Yana has not been documented so far, the interviews are presented bilingually (in a Mooré-Yana mixture and in French), so they may represent a basis for further investigations to linguists as well. The book furthermore offers impulses for historical, ethnological and linguistic research. Gemäß der mündlichen Überlieferung nahmen die zahlreichen politischen Formationen, die bis zur Kolonisierung die Voltaregion (jetzt Burkina Faso) dominierten, vor allem aber die Moose-Staaten ihren Ausgang in dem heute in Nordghana liegende Gambaga. Über Zeitraum, Akteure und Ablauf dieser gewaltigen Expansionsbewegung verfügen wir kaum über gesicherte Informationen, [...] Alle Informationen, die als Mosaiksteinchen zur Rekonstruktion der Genese der politischen Formationen der Voltaregion dienen können, sind daher sehr willkommen, zumal die Forschung auf diesem Gebiet nur sehr langsam voranschreitet. This small book reminds us that even in the twenty-first century there are still areas in Africa which have received virtually no attention from historians or anthropologists. [...] Despite the fact that collections of oral narratives presented as historical source material went out of fashion after the huge UNESCO-sponsored efforts in the 1970s, this book is a laudible enterprise. The local discourses about oral tradition differ sharply from western academic discourses. The rapid disappearance of local historical knowledge and of chains of transmission is perceived as an acute loss of identity.